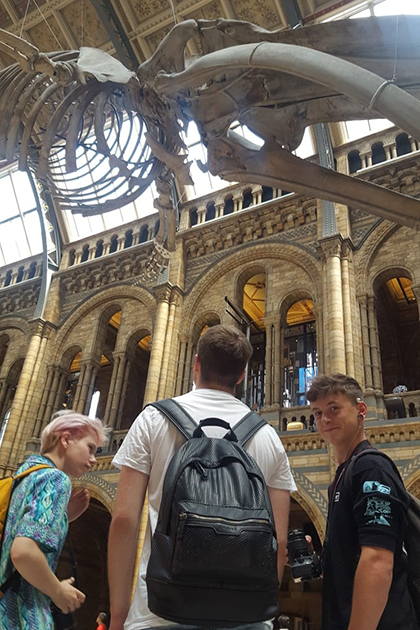 The Visual Arts department at The Sixth Form College, Solihull have been enjoying the sights in London, with two trips last week to visit some of the museums and galleries in the Capital. Year 12 A level Photography students visited the National History Museum and the Victoria and Albert Museum on Thursday, while Year 12 BTEC Art & Design & A level Art travelled to London the previous day to visit the ‘All Too Human’ exhibit at the Tate Britain and the BP Portrait Awards at the National Portrait Gallery. Meanwhile, the Tate Britain houses a substantial collection of the British art, dating back to Tudor times. In particular, there are many works of J. M. W. Turner, who bequeathed all his own collection to the nation. The National Portrait Gallery housing a portraits of historically important and famous British people. This includes paintings of Virginia Woolf, Sir Winston Churchill, King George V, Roald Dahl and Sir Ernest Shackleton.